You thought that by using SpotPass on the Nintendo 3DS system, you might be able to remove the disappointment of accessing the server only to find out that no new messages had come through. That’s right. 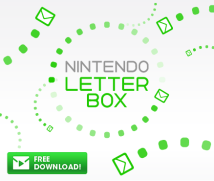 If we used that, what your friends or family had sent would automatically be delivered to your hands, so we thought, “This is good.” I made presentation materials outlining the merits to remaking the software for the Nintendo 3DS system and excitedly took it to you. But no matter how much better it would have been to remake it for the Nintendo 3DS system, it must have been hard for Denyu-sha to take what they had spent so long making for the Nintendo DSi and start all over again. 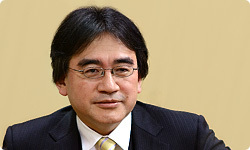 What was your reaction when Imai-san suggested making it for the Nintendo 3DS system? It was a New Year’s of discontent. I’d been told to take it easy, but I didn’t feel easy at all! Then finally, toward the end of January, talk of making it again for a new platform came our way. At that time, the name Nintendo 3DS was still secret. No one had ever said anything to me about 3D, so I was stunned. I felt like we were making software for one seriously stellar machine. Along with that surprise came a bunch of new ideas about what we could do to make the software more fun. 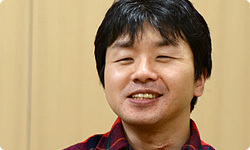 Kondo-san, from the point of view of design, what changed from the Nintendo DSi version to the Nintendo 3DS version? The biggest change was graphics that pop out. On the Nintendo DSi system, you just enjoyed playing what you had written, but on the Nintendo 3DS, the stationery could be 3D and you could write messages that stood out, so that was the biggest change. Was it satisfying to make the pop-out pen? Yes. But we went through quite a process of trial and error for writing in 3D. At first, we tested a pen that would cause it to gradually stand out as you wrote, but once we actually used it, controlling it got too complicated and we couldn’t draw how we wanted. So there was a lot of experimentation. Yes. And we wanted to make something that anyone could do, so in the end we made two options, writing normally and writing with the pop-out pen. You actually could have done something more complicated, but you chose to keep it simple. stationery . How did that come about? Artistic people would be fine, though. Right. We thought that might be one reason people stop keeping diaries and decided to prepare stationery that would stimulate their desire to write something. But we went through a lot of trial-and-error in design. After all, there isn’t any such thing as stereoscopic-3D stationery in real life. Exactly. So we tried all sorts of things with regards to how we could design the stationery to please users. We thought of seasonal themes, things for generating topics, and things that moved and would complement the writing. Yes, right. And we knew stationery was particularly popular with women, so we bought a heap of comic books and magazines that young women would read! We all read them and studied them. And last year around summer or autumn, the stationery was almost done. I think there were about 40 types. No, we made about 50. Looking at them, I thought they were all great. Yes, we were singing our own praises! (laughs) We were telling each other it was a job well done. But someone held the opposite view. 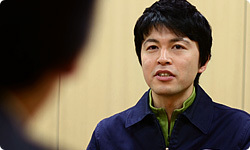 Kitai-san, how did you become involved in the design of the stationery? I was originally working on a different project as designer. Then about summer or autumn last year (2011), our design team received a request to look over the designs. At first you were just to check the design. (laughs) What did you write? No, I remember you being even harsher. No...do I really have to say it?